You can create reports from R&D Focus (web platform) using BizInt Smart Charts for Drug Pipelines. Note: Depending on your internet connection, you may only be able to export 25-50 records per export. Chemical structures cannot be exported. 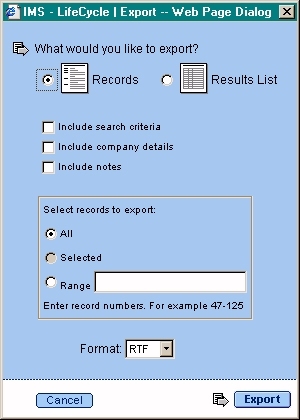 Do your search, and then select the Export icon above the list of records. On the export dialog, select Records, the range of records you wish to export (the current limit is 250), and RTF format. Click the Export button. A "Busy exporting" dialog may appear. You will then be asked to either save or open the file. Save the file with a location and file name you will remember. Note: Do not open or edit the RTF file in Word, or you will not be able to import it into BizInt Smart Charts. In BizInt Smart Charts for Drug Pipelines, use the File | Import command to import the RTF file.